Fifty years ago the Second Ecumenical Council of the Vatican opened. Thousands of bishops from across the catholic world has assembled to discuss how best the Church could meet the needs of the Twentieth century. One of the most noticeable areas they addressed was the Scared Liturgy. The Constitution on the Sacred Liturgy, Sacrosanctam Concilium, was the first major document to be produced by the Council. In this anniversary year it is worth looking again to see what the Church has solemnly decreed regarding singing in the liturgy, to refresh ourselves and continual renewal in the Church. 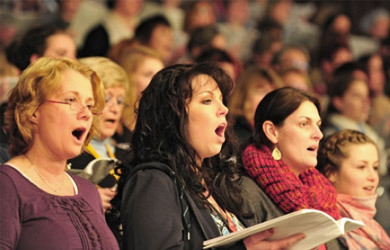 We will look particularly at singing and music in the Mass. It might be worth first looking, in a broad way, at the musical situation in the Church before the council. There existed, and continue to exist in the extraordinary form of the liturgy, three types of Mass. Low Mass (at which nothing was supposed to be sung), Missa Cantata (in which almost everything spoken in a clear voice in the Low Mass was sung) and High Mass (which as far as what was sung is concerned is the same as a Missa Cantata). There was meant to be no variation in what could be sung, the texts for singing were laid down in the missal. It was a rather all or nothing approach that meant many parishes couldn’t achieve a sung Mass and in others priests found themselves struggling to sing difficult texts they couldn’t manage. Of course there were places where the Church’s high ideals of sacred music were achieved, one thinks of Westminster Cathedral and it’s revival of renaissance polyphony. The style of music was also quite structured by the documents of the Church. Plainsong was given pride of place supplemented by polyphonic works with some allowance for classical composers. This only added to the strain placed on small parishes. The result of all this was often that parishes never had either a Missa Cantata nor a High Mass. Many places resorted to singing devotional hymns over a low Mass in place of the texts the Church had chosen to be sung in keeping with the feast. The Council in addressing itself to sacred music sought to deal with these issues, as did the post-conicliar instructions of the magisterium on the liturgy. So, before addressing the details of sacred music let’s set the scene on how the council and the following magisterium views music in general. Sacrosanctum Concilium tells us the “musical tradition of the universal Church is a treasure of inestimable value, greater than that of any art.” This is high praise indeed, something that must be kept in mind whenever we consider what we must sing at Mass. We are not dealing with something of our own making but a treasure preciously guarded by the Church, so therefore we cannot simply choose anything we wish for the liturgy. Moreover, an art treasure, such as sacred music, requires professional advice. Sacred music like any other art is a skilled business and requires training to understand. 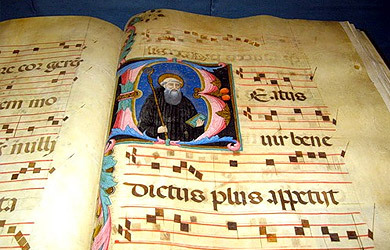 The same constitution states that music is an integral part of the liturgy. Therefore it is essential. 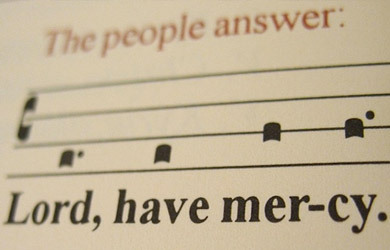 Sacred music is praised by both scripture and the Father’s of the Church. Christians are required by the Apostle Paul to sing together psalms, hymns and spiritual canticles (Col 3:16). The Acts of the Apostles tells us that singing is the sign of the hearts joy (Acts 2:46). Both of these quotes are mentioned by the General Instruction of the Roman Missal. This demonstrates clearly that the Church draws her attitude toward sacred music from divine revelation. It is not simply an invention of some clerics in Rome and so its rules are not to be lightly ignored. The GIRM also quotes Augustine, who says that “whoever sings well prays twice”. Therefore song aids our prayer life and so all solemn prayers should be sung if possible, an important principle to bear in mind. The constitution on the liturgy before giving instructions and directives on music gives us some general principles by which we can judge the suitability of a particular type of music. Whether it confers greater solemnity upon the sacred rites. If we bear in mind these three points (and also the order they are placed in) we can discern, in planning our liturgies, whether the music is appropriate. The council states that these three qualities make music sacred. There fore it draws the conclusion that any music may be admitted to the liturgy providing it conforms to these criteria. These two purposes correspond to the purposes of the liturgy itself. Therefore we must draw the conclusion that sacred music is not an add-on to the liturgy but a fundamental part of it. The instruction Musicam Sacramtells us that when the liturgy is sung it more clearly pre-figures the liturgy of the heavenly Jerusalem. Thus sung liturgy more clearly expresses its inner reality. Sung liturgy lifts our minds to heavenly realities. In the next article we will address ourselves to the finer details of what we should be signing at Mass and how. Sacrosanctum Concilium, Vatican II, no.112. Musicam Sacram, Sacred Congregation of Rites, no.5.